It didn't strike me at the time - since I was only nine in 1984 and everyone in music seemed incredibly old - but the top 50 wasn't as ageist as it is these days. Indeed, it was possible to have chart hits well into your late thirties and forties. This week in 1984, most of the new entries on the ARIA singles chart were from acts that'd been around for quite some time - both in terms of their recording careers and their lives. You wouldn't see that among the teenage DJs and twentysomething rappers that clutter the top 50 today. After its top 20 debut last week, "99 Luftballons/99 Red Balloons" by Nena skyrocketed straight to number 1 this week in 1984. It'd stay there for five weeks. Despite being "the first multi-track digital single recorded in Australia", this pop track was the least successful song called "Midnight Blue" to grace the Australian top 100. He started his music career as a teenage sensation, racking up eight consecutive top 10 hits in 1965 and 1966. 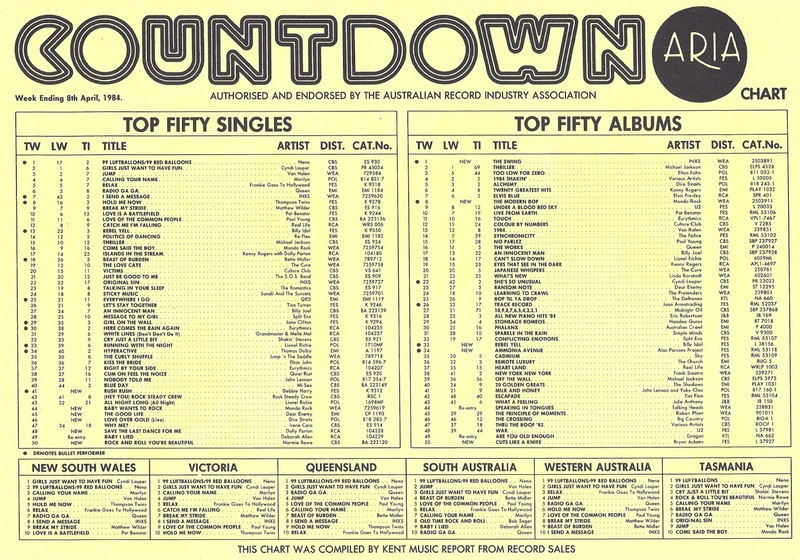 By 1984, Normie Rowe was 37 and hadn't seen the inside of the top 50 since 1970. This tune, which sounds like it could've come from Normie's heyday, would clearly have appealed to his nostalgic fans, of whom there were enough to give him one final top 50 placement before he became better known for starring in Sons & Daughters and getting into fisticuffs on daytime TV. Born the year before Normie, Dolly Parton had been releasing records since 1959 and visiting the Australian chart since 1972. In 1984, at age 38, she was coming off her first - and only - number 1 single, "Islands In The Stream". Taken from an album of covers called The Great Pretender, "Save The Last Dance For Me" was Dolly's version of the 1960 hit by The Drifters - and saw her in pop rather than country mode. This was it from Dolly for a while - she'd next be seen on the chart in 1985 when she reunited with Kenny Rogers for another duet. Compared to Normie and Dolly, Dire Straits were relative newcomers, having released their first album in 1978. But singer Mark Knopfler was no spring chicken, a few months away from turning 35 at this point and with his band's biggest album still to come. This live version of the title track from Dire Straits' last studio effort was released to promote concert album Alchemy, which had debuted on the albums chart the previous week. "Love Over Gold" was not, however, included on all versions of Alchemy - it was left off the double LP release but featured on the cassette and CD versions. Thanks to a bit of Facebook stalking, it would seem Dear Enemy singer Ron Martini was 29 years old in April 1984, making him easily the youngest singer of one of this week's new entries. 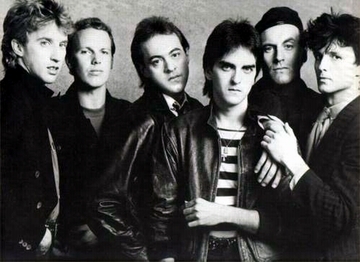 Formed in 1980, Dear Enemy were coming off the back of the top 20 success of debut single "Computer One" and although they had another catchy new wave-influenced track in "The Good Life", it didn't make the same connection with the record-buying public. The band's album Ransom Note did better, reaching number 23, but it was downhill from here for the Melbourne band. Like Dire Straits, Mondo Rock had been releasing music since 1978, but singer Ross Wilson had been on the scene for a lot longer than that. The former Daddy Cool frontman was 37 when his band followed up number 2 summer smash "Come Said The Boy" with this second single from The Modern Bop, which debuted on the albums chart at number 8 this week. Although it was another top 20 single from the consistently successful (at this stage) Mondo Rock, "Baby Wants To Rock" is the only of those hits I don't recall from the time. At almost 39 years old, Debbie Harry was the oldest of the singers of this week's new entries, but then she'd been in her thirties when Blondie had released their debut single in 1976. By 1984, Blondie were no more (for the time being) and Debbie resumed her solo career with this single from the soundtrack to Scarface. In keeping with the movie's subject matter, "Rush Rush" is about drug use - "yeyo" is Latino for cocaine. The song was Debbie's second collaboration with songwriter/producer Giorgio Moroder, who Blondie had worked with on "Call Me" (which was taken from the film American Gigolo). And although it's not as good as "Call Me", it's fair to say "Rush Rush" was an improvement on Debbie's first solo project, the KooKoo album. 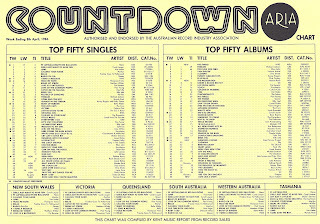 Next week: the arrival of pop royalty on the ARIA top 50 - and a British male singer with big hair also makes his debut. Plus, a single by a legendary Aussie rock band that was kept alive for years on Hey Hey It's Saturday. I only really know Normie Rowe via his (rather bad, IMO) stint in 'Sons & Daughters', watching the repeats a few years ago. I would've thought he'd be older than 38-39 when he did that. Eek! Dolly sounds more like Dolly the Sheep with that vibrato. The Dear Enemy song is fairly decent synthpop for Australia at this point. Debbie Harry's solo career deserved more success. I'm glad 'Rush Rush' was a hit of sorts here. I don't understand why it bombed in the UK.